Surveys on drinking habits consistently see respondents underestimating how much they drink, however, according to Drinkaware, 80% of the UK population drink alcohol, while 27% of us are classed as binge drinkers. In this article, we’ll look at how our genetic makeup influences both how much alcohol we drink and how it affects us. Some studies have reported drinking moderate amounts of alcohol can have positive effects on health, such as its ability to increase levels of HDL, the beneficial 'good' type of cholesterol (1), and moderate alcohol consumption has been found to be connected with a reduced risk of heart attack and stroke. Drinking 1-2 drinks per day has been reported to protect against Type 2 diabetes and gallstones. But whilst some studies have found a protective effect of moderate alcohol consumption, other studies have found even a small amount of alcohol to increase risk of mortality. So, it is important to emphasise that research into potential health benefits of moderate alcohol consumption should not be taken as licence to drink in anything but occasional and small amounts. According to the Office for National Statistics, alcohol was directly responsible for almost 7700 deaths in the UK in 2017. This relates only to deaths from alcohol misuse such as alcoholic liver disease and excludes chronic illnesses where alcohol is a contributory factor, such as heart disease and cancer. It’s a growing problem and incidence is increasing for the over 50s. At particular risk appear to be females between the ages of 55 and 59 (2). The NHS states there were over 1.1 million hospital admissions in the UK in 2018 involving alcohol (3). Almost 25% adults in England and Scotland regularly drink over the Chief Medical Officer’s low risk guidelines of a maximum of 14 units per week, and according to Public Health England, there are almost 600,000 dependent drinkers in England. Alcohol is accepted to be a direct causal factor in over 60 different medical conditions including many cancers, liver disease, high blood pressure and even depression, but in fact, the World Health Organisation (WHO) estimates alcohol is connected with more than 200 diseases. Despite these sobering statistics, many of us still carry on drinking. For the majority of drinkers, it’s a pleasurable part of life. But have you ever wondered why some people are affected by just a tiny amount of alcohol and other people seem to be able to put away numerous drinks without ill effects? Or why some people seem to be able to easily avoid the temptation of a tipple? It could be down to genetics. 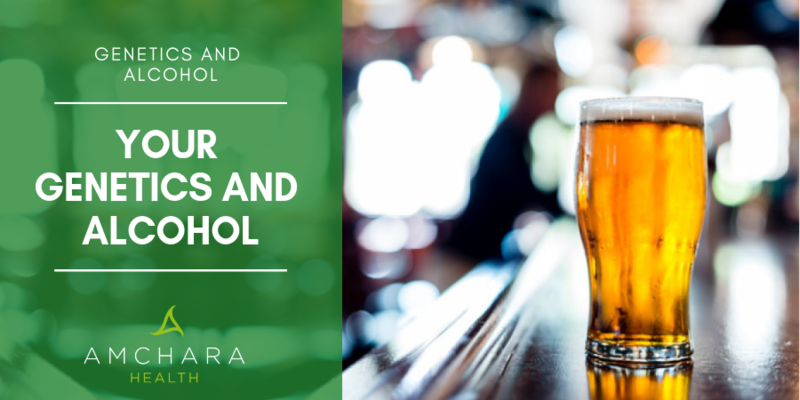 Alcohol is comprised of ethanol, and the effects felt when we drink it depend on the concentration of ethanol and how long it remains in the body before it’s broken down. Alcohol is a mood-altering substance. As it can easily pass the blood brain barrier it affects the parts of the brain responsible for self-control, inhibition and balance. Alcohol influences both inhibitory and excitatory neurotransmitters - boosting the inhibitory ones and reducing the excitatory ones, with the net result being our reactions, along with our speech, thinking and movement, are slowed. Alcohol also causes the release of dopamine, the brain neurotransmitter associated with reward and pleasure. Our bodies can’t store ethanol, so once we have a drink, it’s quickly absorbed from the stomach and small intestine and makes its way around in the bloodstream to the liver to be broken down. Ethanol can’t be simply shunted out of the body as it is, as it needs to be altered by the liver first. Alcohol detoxification occurs in the liver in two steps. In the first step, alcohol is transformed into a substance called acetaldehyde by an enzyme called alcohol dehydrogenase. A dehydrogenase enzyme is an enzyme which acts as a catalyst for the removal of hydrogen from a molecule. Literally, the ethanol molecule is broken apart. Many substances are detoxified by the liver in two or more steps, and often the intermediate substance produced is more dangerous than the initial toxin. This is the case with acetaldehyde, which is significantly more toxic than ethanol and can damage the liver. Usually, it is only present in the body for a short period of time before it’s broken down. Secondly, acetaldehyde is converted to acetate. This is helped by the enzyme aldehyde dehydrogenase. Acetate is an energy rich substance and can be used as fuel for the brain instead of glucose. Otherwise, it is broken down into carbon dioxide and water, usually in tissues around the body rather than in the liver. It’s crucial the second step keeps pace with the first so acetaldehyde does not build up in the body. Acetaldehyde can alter DNA expression and act as a carcinogen unless it’s properly converted onwards to acetate. It ’s believed acetaldehyde may also be responsible for some of the effects attributed to alcohol, such as lack of co-ordination and memory loss. Acetaldehyde can also cause the release of a substance called histamine. This is a substance which is produced by our immune system when it comes into contact with an allergen. When alcohol is drunk, excess circulating histamine can leads to flushing, an increase in skin temperature and skin reddening. This is termed the ‘alcohol flush reaction’. Many people of Chinese, Japanese and Korean origin experience this. Genes affecting alcohol metabolism provide instructions for the enzymes which break it down. ADH genes encode the enzyme needed to break down ethanol to acetaldehyde, while ALDH genes instruct the enzyme needed for the onward conversion stage which results in acetate. Our genetic code determines how effectively we metabolise alcohol. Each gene can have a fast or a slow version. Variants of DNA coding affect how quickly each part of the detoxification process proceeds - in other words how quickly we metabolise ethanol to acetaldehyde and acetaldehyde to acetate. These variations have been found to influence how much we drink and how susceptible we are to becoming dependent on alcohol (4). Studies have found the speed of the transformation of ethanol to acetaldehyde can vary up to eightfold. Fast metabolisers of ethanol to acetaldehyde are less likely to experience the physical effects of alcohol as ethanol is quickly metabolised away. Because of this, these people tend to be able to drink more. However, if the second step of detoxification is slow, they may experience the effects of acetaldehyde build-up such as facial flushing, and because this is unpleasant, they’ll tend to drink less. Researchers have found people who are exposed to high amounts of acetaldehyde, even though they tend to drink less alcohol, appear to have a greater risk of developing certain cancers, such as those of the mouth and throat (5). If you convert ethanol to acetaldehyde at a normal rate, you’ll be at a low risk of acetaldehyde toxicity unless excessive amounts of alcohol are drunk. People who are slow in converting ethanol to acetaldehyde will experience the effects of alcohol far more and for longer. These people may even experience the positive effects of alcohol consumption on health. This is because ethanol can increase HDL cholesterol, the beneficial type of cholesterol, and slow metabolisers will have ethanol hanging around for longer. They therefore may experience these benefits while fast metabolisers do not. These differences may explain the conflicting results researchers have discovered when looking at the benefits of alcohol and health. As we mentioned at the start, some studies have found a protective effect of moderate alcohol consumption, for example on cardiovascular health, while other studies have found even a small amount of alcohol to increase the risk of mortality. Genetics plays a role in the taste of alcohol, and therefore how appealing it is to us. A variant of one particular gene determines how well we can taste bitter substances. People who are very sensitive to bitter tastes find the flavour of alcoholic drinks unappealing and so do not consume them as often (6). As may be expected, a genetically determined taste for alcohol is correlated with dependence. Individual genetic differences influence our dopamine receptors – in other words, how much we experience the effects of the ‘feel good’ neurotransmitter which is released when we drink alcohol. The more sensitive we are to dopamine, the more we’ll feel a positive effect from drinking alcohol. Studies have shown this is connected with how often alcohol is drunk (7). Caffeine, St John’s Wort and cruciferous vegetables as well as vitamin B3 and zinc are known to increase the speed of the first step in alcohol detoxification. While it’s good to support this pathway, care should be taken if the next stage is lagging behind, otherwise, acetaldehyde will build up. Your liver shoulders the burden of detoxifying all manner of substances, not just alcohol. We can support this amazing organ through our food choices as well as with liver supporting herbs. Make sure you eat plenty of leafy green vegetables, packed with antioxidants. Cruciferous vegetables like broccoli and kale contain specific substances which support liver detoxification. Chlorella and wheatgrass contain chlorophyll which can support liver detoxification processes. Incorporate garlic, onion and turmeric into your recipes. Drink green tea, packed with liver-friendly antioxidants. Cook with coconut oil, which has anti-inflammatory properties. It also helps combat fatty liver which can be caused by alcohol. Choose liver supporting herbs like milk thistle, which has traditionally been used to support liver function for thousands of years. It contains the active ingredient silymarin. Other liver supporting herbs include artichoke leaf and dandelion root. Avoid fats which have been processed, excess sugar, and high fructose corn syrup. These all need to be processed by the liver, adding to its load. Genetics influence every single one of our body processes. DNA testing can reveal your personal inherited tendencies which affect both your body’s detoxification processes and your susceptibility to alcohol dependence. At Amchara we offer genetic tests which can provide an in-depth analysis of your personal genetic make-up. 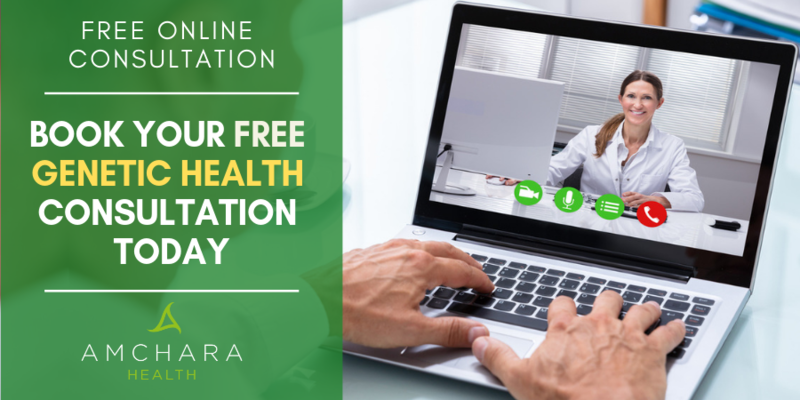 Such a test can help you make sensible, sustainable nutritional and lifestyle changes to support your liver’s detoxification processes. A consultation with a therapist can help to interpret your results. With your comments let’s continue the conversation. Let us know your top tips to support your liver health.